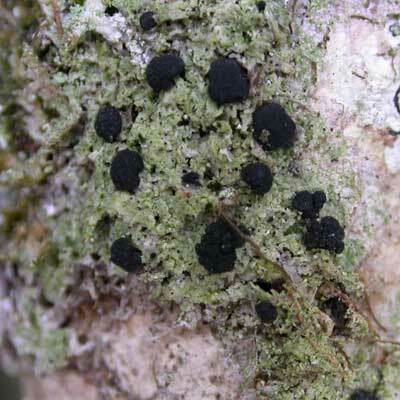 This crustose species is characteristic of old, damp woodlands where it occurs on the mossy trunks of ash, willow and oak. It is frequently sterile (without discs) appearing as a thick, blue-green crust (greyer when dry) the surface becoming granular-sorediate. 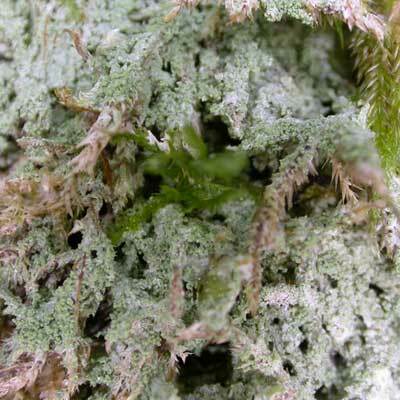 Naming it in the field can often have lichenologists scratching their heads. When discs are present the naming process is simplified, as these are seen to be jet black with a pale margin. It Ireland it occurs mainly in the west and north. A species of damp woodland, often growing on trees lining streams or river courses. Simms, M. J., (2016). Megalaria pulverea (Borrer) Hafellner & E.Schreiner. [In] LichenIreland.